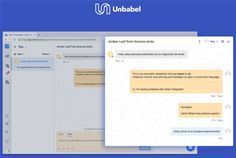 San Francisco, Lisbon, London – 9 January 2018: Enterprise Translation-as-a-Service provider Unbabel today announced the release of its Unbabel Chat app to Intercom’s App Store. Intercom, a customer messaging platform that helps businesses accelerate growth through better customer relationships, announced the launch of its App Store earlier this year. Today the App Store features more than 130 apps that help businesses and customers complete tasks inside the messenger. The Unbabel app lets Intercom customers see inbound chat messages in their own language and respond to them in their customer’s preferred language rapidly, a big bonus for sales and support teams dealing with global queries. Unbabel can now share its services with Intercom customers globally and help more companies break down language barriers between enterprises and their customers around the world. Intercom is the world’s first customer messaging platform to help internet businesses accelerate growth. Intercom is a new and better way for businesses to acquire, engage and retain customers and its modern products help sales, marketing and support to connect with customers and grow faster. Today Intercom powers more than 500 million monthly conversations and reaches over 1B+ people worldwide across our 30,000 paying customers. Unbabel's “Translation as a Service” platform allows modern enterprises to understand and be understood by their customers in dozens of languages. Powered by state-of-the-art AI and refined by a global crowd of thousands, Unbabel helps global brands like Booking.com, Facebook, Skyscanner, easyJet, Under Armour and Rovio remove language as a concern, increasing customer satisfaction and building a more efficient customer service operation in the process. Backed by Scale Venture Partners, Notion, Microsoft Ventures, Salesforce Ventures, Samsung NEXT and Y Combinator, Unbabel is accelerating the shift to a world without language barriers.